An increasing number of San Diego schools are turning to well-trained dogs to help campus officials find what they can't see. Interquest Detection Canines, one of the largest companies of its kind in Southern California, contracts with nearly 2 dozen school districts in San Diego County. The handlers bring the dogs to campuses to sniff out illegal substances and items like drugs and guns. The company has five different dogs capable of detecting four categories of contraband: alcohol, drugs, medication, and gun powder. 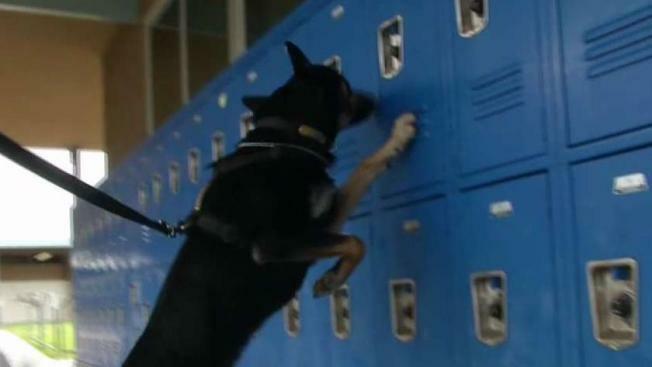 In their first ever demonstration for a news organization, Interquest San Diego Regional Manager Tonya Anderson showed NBC 7 how a 1-and-a-half-year-old Australian Kelpie named Astro could zero in on a splash of vodka hidden inside a locker. "I do this and I find it rewarding because I know we're keeping schools safe" Anderson said. The dogs are rewarded with their favorite toy when they alert their handler to a suspicious scent and consider the campus visits akin to a game of hide and seek. But administrators who rely on the service as part of their continuing effort to keep their campuses safe say the dogs are part of the larger plan to make students aware of the choices they make before arriving to school. Eric Solorzano, who oversees the program with the Escondido Union School District, said the feedback from parents has been pretty positive. Escondido Union brings the dogs to their middle school campuses once a month to search classrooms. The students are not inside the classrooms, when the dogs do the searches of backpacks, jackets, and desks. According to Solorzano, most of the time the dogs pick up on "residual smells" on the personal items of students. The smells could be leftovers from things like a drip of alcohol on a backpack or a purse which used to carry marijuana. "What that does is allows us to have a conversation with that family. Where is that residual smell coming from? What are the students having access to outside of school that is giving that smell onto the backpack or jacket?" said Solorzano. Anderson once had a dog alert to a blue plastic chair in a classroom. The administrator called the student who had been sitting in the chair moments before to the office only to find two bags of cocaine in the student's wallet. "The dog never had to sniff that student to smell that cocaine in the wallet," Anderson said. Interquest's dogs usually spend 1 to 3 hours on a campus searching classrooms, lockers, bathrooms, parking lots, and anywhere else where contraband could be hiding. Click here for a full list of Interquest Detection Canines' campus clients.